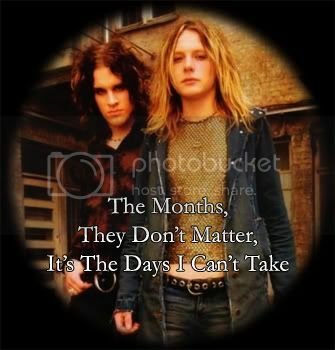 "The Months They Don't Matter, It's The Days I Can't Take"
very marrow of my bones, but you would not give it to me. You didn't even blink an eye. Therefore, I have decided that things will be better if I am no longer here to bother you. think. I love you Laur, and it's not always bad. Most of the time, it's more than wonderful. But how does that song go? " The months they don't matter, it's the days I can't take. " hate me for this forever. You're a good man Lauri. Really you are. I will love you always. Jonne frowned as he signed his name onto the paper, a single solitary tear landing right on top of the "J" in his name. He seemed to think for a moment, then wadded the paper up and threw it into the wastebasket. He knew that he could never really do that to Larry. If Larry really cared about him the way that he said he did, it would devastate him. Jonne just wished sometimes that Larry would pay some tiny smidgeon of attention to him, or show some little inkling of a hint that he loved him. Sometimes Larry did, but it was never when he needed it the most. At that moment, he really did want to die, to go to sleep and never wake up, and it wasn't an attempt to get attention anymore. Life didn't seem worth it without Larry's love and affection. But again, he knew he could never do anything drastic like that - it would hurt Larry too deeply and that wasn't what he wanted at all. For Larry, he would bear the pain. Tears streaming down his cheeks, Jonne climbed into bed and got underneath the covers, attempting to make himself as small as possible. He felt empty and cold, even though it was almost uncomfortably warm in the room. Shivering, he clutched Larry's pillow tightly to his chest, inhaling his scent, wanting nothing more than for Larry to hold him. But once again, Larry wasn't there, and only the creaking noises of the empty house where there to keep Jonne company.